Eimear and Simon’s honey comes from bees in two apiaries in Co. Wicklow, Ireland. One is near Kilmacanogue, and the other on the western side of the sugarloaf. The flowers that they visit are varied. Moreover, the changing weather can help or hinder a flower – and because the honey gets its distinctive flavour from the flowers that the bee visits, the honey varies year-on-year, too. Honey is made by a very natural process – because our bees are given every advantage in life by the beekeeper, they make a much bigger surplus at the end of the summer than their wild or feral brethren. The beekeeper removes the surplus, spins it out of the honey frames, filters it, and puts in a sterile jar. NB many advise that raw honey should not be given to infants under 12 months. In time, all honey will change from a liquid to a solid. This process, known as granulation, is entirely natural. If you prefer your honey liquid, then heat your jar gently (for example in a hot press) until the honey becomes liquid again. Be sure not to heat the honey too much, because heat kills the valuable enzymes in honey. We are always keen to recycle and reuse our honey jars, so all returned jars will be gratefully received. 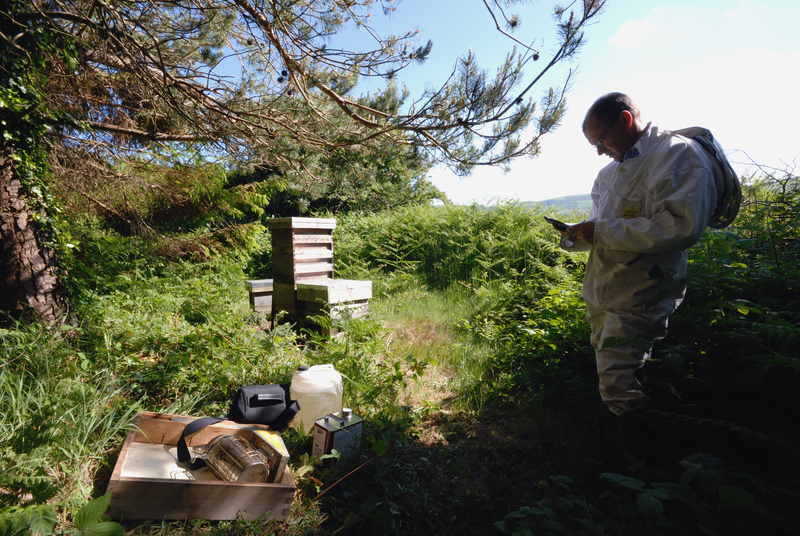 If you would like to buy some honey or would like us us to pass any messages on to our bees, just email us at simon[at]simonrees.com. Thanks for dropping by. Hi, Is this Natural Raw Honey? and where in Dublin i can get it. I would like to buy some of your honey, are you selling? Hi ,where can I buy your raw honey in Dublin? It’s tricky getting honey from small local producers except in late summer. I know that a stall on the Coppinger Row farmers market in D2 (on Thursdays) sells Tipperary honey (from a small beekeeper that I know & trust called Galtee Beekeepers). Make sure you come to this http://dublinbees.org/meet-the-beekeepers/the-dublin-honey-show/ on Nov 8th – there you can buy the best Irish honey. Get there early because we sell out! I really would like to buy some of your honey. I suffer from mild hay fever and have heard that honey from a local area can help. Looking forward to hearing from you. Sorry but I don’t have any for sale – my last year’s crop is all gone & this year’s won’t be available for a few months. I suggest you check your local delis for Irish honey from small producers. In my humble opinion, honey from a small producer anywhere in Ireland should help as much as local honey. Hi…Wondering when is the best time to purchase your honey ? Just wondering if you are selling any local honey at the moment? I Live in Bray – Can I buy some of your Honey – Please ? Hi just wondering have u any honey to sell?I’m in kilmaca, needed for a 9 year old who is suffering bad with hay fever.thanks. Hi Simon I would like to purchase some of your honey I live in Killiney so I could collect at any time, can you please let me know where you are? I’ve none at the moment, try local delis. How does the temperature affect how fast I run?